We love working with different timbers to create our beautiful bespoke worktops. As a final step in completing a kitchen, our wooden worktops really make your room stand out from the crowd. But of course, we understand that our customers like to see things for themselves before they place their order. Whilst we encourage wholeheartedly that you visit our beautiful showroom in West Raynham, we do appreciate that this is not always possible and thus we offer the opportunity to purchase samples of our worktops, to be delivered to your home. Our samples allow you to see the different wood types, grain patterns and finish options available. By purchasing our samples first, you can ensure that you are making an informed decision about what material you would prefer to use for your kitchen worktop and know that you have explored all possible options. Iroko. This beautiful wood is a magnificent golden honey colour, bringing natural warmth and colour to any space. With a natural mix of light and dark tones, this is the perfect choice for any kitchen. 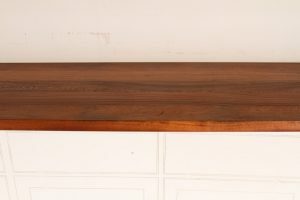 A slightly more unusual choice of worktop timber, Iroko adds a unique feature to a kitchen, and is perfect for a feature piece such as an Island or table top. A more recent addition to our timber options as Iroko has been one of the most difficult wood types to find from an certified source, but after years of searching, we finally have one and are so happy to provide this sustainable timber choice. 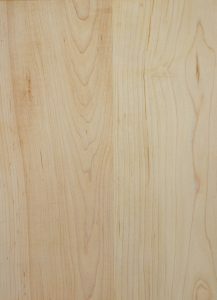 Maple, a pale wood, that gives the same luxurious glow and lightness of Ash, without as much of the grain. Another great choice for a fresh feeling kitchen. With grain looking like crushed silk, we use it to great effect in kitchens where light can be an issue, or we want to balance out the colours of the units and walls. Maple is an incredibly hard wood, harder than oak even, and once oiled, this timber reflects light beautifully. Cherry is a rich coloured timber and looks beautiful in all kitchen types, adding a beautiful unique colouring that is so statement. A natural timber that once oiled looks almost metallic, this worktop timber choice is certainly one that makes an impact. One way to make this timber pop even more is to pair it with neutral coloured cabinets to really let the bright red colouring shine and take the centre stage. As well as being incredibly beautiful, this wood is very dense with a fine, close grain giving it an even texture. 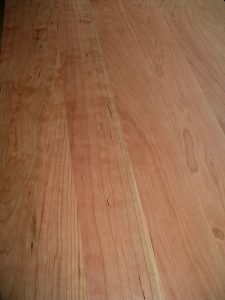 The Cherry timber we use is called 95/50, which means the top surface must be at least 95 % red (as opposed to cream) and the underside at least 50 %. Sapele has fascinating grain patterns and a lovely chocolatey hue. This timber makes for a vibrant worktop whilst adding an elegant touch. 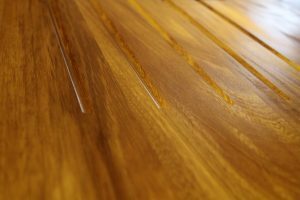 Our Sapele timber possesses a beautiful grain pattern of long straight lines of contrasting dark lines with hints of golden highlights. Sapele is the darkest of our African timbers, and is a fantastic choice for any kitchen which can be improved by a rich dark coloured worktop. Wide Block – This is a very popular option for a wooden worktop. Using wide joined stave, this worktop style will allow you to really make a feature of your chosen wood, as it shows more of the grain, and looks subtle yet beautiful in any kitchen. Traditional Plank – Inspired by stately homes, the Norfolk Oak traditional plank uses similar techniques to worktop construction found four hundred years ago. Portraying beautiful symmetry in length and placement, the traditional plank marries well with all wood textures and is the epitome of a country kitchen. Superstave – This style of worktop offers full stave planks to create the most memorable impact. As well as being the Norfolk Oak signature style, the Superstave is very much the Rolls Royce in kitchen worktop design. Bringing uniformity and chic style to the fold, the Superstave also showcases the character of the grain, making the most of the natural beauty of the timber. End Grain – Not only does an end grain worktop make for a beautiful addition to any work surface but it is a must-have for any chief worth their salt! Used traditionally by butchers, the end grain is the best surface for preparing dishes and chopping meat, and looks absolutely beautiful in any timber type. As well as being highly functional, it looks magnificent, both as a work-surface and as an individual chopping board, adding traditional charm to your kitchen. We offer a variety of options from our finishing room, including pre-installation oiling and clear lacquer. We will also provide you with a non-treated surface if you would prefer to treat your worktop yourself during installation. However, one of the most exciting things about a Norfolk Oak worktop is the option to have it Nano-coated. An innovation of the 21st Century, our Nano-coating is the best protection for your worktop, designed to not only enhance the natural beauty of the grain but to resist any damage of a busy kitchen environment. Using a special mixture of solvents and resin to provide a long lasting protection, the Nano-Treatment repels dirt, soap scum and water, making it a dream to clean and maintain. Not only this, but Nano-treatment protects the natural colours of the timber from UV damage and greying! So there is no need to worry about placing your gorgeous new work-surface in sunlight. Just let it shine. Check out our Facebook Page, Twitter and Instagram for more pictures and information! Guest blog post written by Lauren Campbell.